Pope’s Blessing, Catacombs & more! What a day! 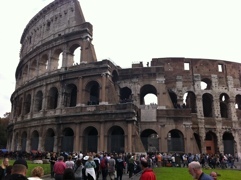 First full day in Rome. Our group had a great day. I’ve captured it on video so you can share it with us. Started out with a great breakfast before our tour of the Ancient Roman Forum and the Colosseum. The highlight was seeing Pope Benedict at St. Peters for his noon Angelus and Papal Blessing. 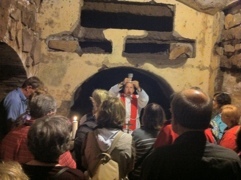 After a six course lunch at Cecilia Metella Restaurant on the Via Appia we toured the Catacombs of Callixtus and celebrated Mass deep under ground. Everyone is now back to our hotel and scattering to shop and find a cafe for dinner. Banner day!